The next VSRA General Membership Luncheon will be held on Tuesday, April 18, 2017 at the Portsmouth Renaissance Hotel in the Holley Ballroom (1st Floor). 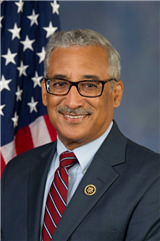 The featured Guest Speaker will be Congressman Bobby Scott of the United States House of Representatives. Congressman Robert C. "Bobby" Scott is currently serving his thirteenth term in Congress representing Virginia’s Third Congressional District. Prior to serving in the House of Representatives, he served in the Virginia House of Delegates from 1978 to 1983 and in the Senate of Virginia from 1983 to 1993.
and local governments for evidence-based strategies and programs to prevent juvenile crime. Congressman Scott is also a recognized champion of the U.S. Constitution and the Bill of Rights, and has fought to protect the rights and civil liberties of all Americans. In 1997, he protected the right of all children with disabilities to obtain a free and appropriate education under the Individuals with Disabilities Education Act (IDEA) by leading a successful effort to defeat amendments aimed at curtailing that right for some children. Congressman Scott also actively opposed passage of the USA PATRIOT Act and has been a leading critic of both Republican and Democratic Administrations' misuse of surveillance authorities. He is also a leading opponent of efforts to permit employment discrimination in federally funded programs. Congressman Scott is also a strong supporter of our nation's military readiness as well as our troops and their safety. He is a leading advocate for improving and increasing funding for veterans' benefits and health care, especially mental health care, and was the lead sponsor in the House of Senator Jim Webb’s Post-9/11 G.I. Bill that was signed into law by President George W. Bush in 2008. Congressman Scott has routinely received an “A” from the Iraq and Afghanistan Veterans of America for his service and commitment to our veterans. In 2010, The Hill, a Capitol Hill newspaper, recognized Congressman Scott as one of the 25 hardest working Members of Congress. The Hill later recognized him in 2012 as one of Capitol Hill's 50 most beautiful people. Congressman Scott is a member of St. Augustine's Episcopal Church in Newport News and is a member of many professional, community, and civic boards and organizations.